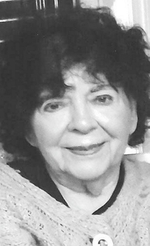 Madeline (Babe) Pegula Barchak, Jessup, died peacefully in her home Sunday, Aug. 5, 2018, after an illness. Her loving husband of 67 years, Stanley, died in January 2014. Madeline was born Dec. 12, 1927, and was the daughter of the late Anna Chekan Pegula and Andrew Pegula. She was a devout Catholic and a member of Holy Ghost Byzantine Catholic Church in Jessup. She was a graduate of Jessup High School and the Hoyt School of Practical Nursing. Madeline loved her family, church and home immensely and was very creative with her domestic abilities, especially cooking and baking. Being a great storyteller, she reminisced about her past. Her stories will never be forgotten. She was a quiet person who loved music and enjoyed playing the organ and listening to Polka Party every weekend. She was smart, helpful and considerate of others and will certainly be missed. Surviving are her son, Stanley (Cook), Jessup; daughter, Terri Kurilla and husband, Ron, Archbald; granddaughter, Renee Kurilla Zulawnik and husband, Keith; and great-granddaughter, Zoey Annette Zulawnik, Bellingham, Mass. ; brother, John Pegula, Scranton; nieces, nephews and great-nieces and great-nephews. She was also preceded in death by her sisters, Malvene Pegula, Mary Switz, Anna Roman and Martha Ceccarelli; and brothers, George, Andrew, Myron and infant brother, Michael Pegula. Madeline's family would like to express its thanks to the staff and nurses from Hospice of the Sacred Heart, Dunmore, for their kind help, concern and compassionate care during this difficult time. The funeral will be Wednesday, Aug. 8, from the Arthur A. Albini Funeral Home, 1003 Church St., Jessup, with Divine Liturgy at 11 a.m. in Holy Ghost Byzantine Catholic Church, First Avenue, Jessup. Interment, parish cemetery, Jessup. Relatives and friends may call Wednesday at the funeral home from 9 to 10:30 a.m.
To send flowers to the family of Madeline Barchak, please visit our Heartfelt Sympathies Store.